Hello Spring! 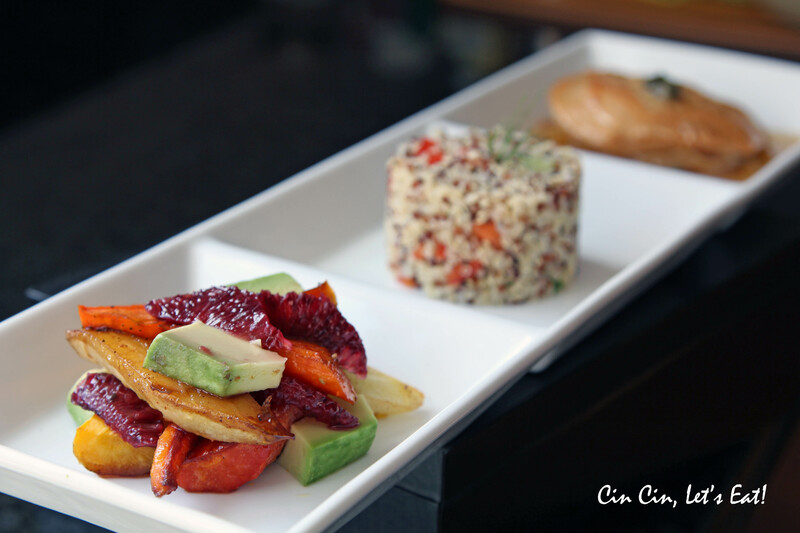 Lunch Trio – Roasted Carrots, Quinoa Salad, and Lemon Caper Chicken [recipe] – Cin Cin, Let's Eat! What an awesome week of weather we had here in California. Mid-70s with a light breeze, Spring is here! A trip to the local farmers’ market really inspired me to use some beautiful and colorful in-season produce and cook up this delightful lunch. 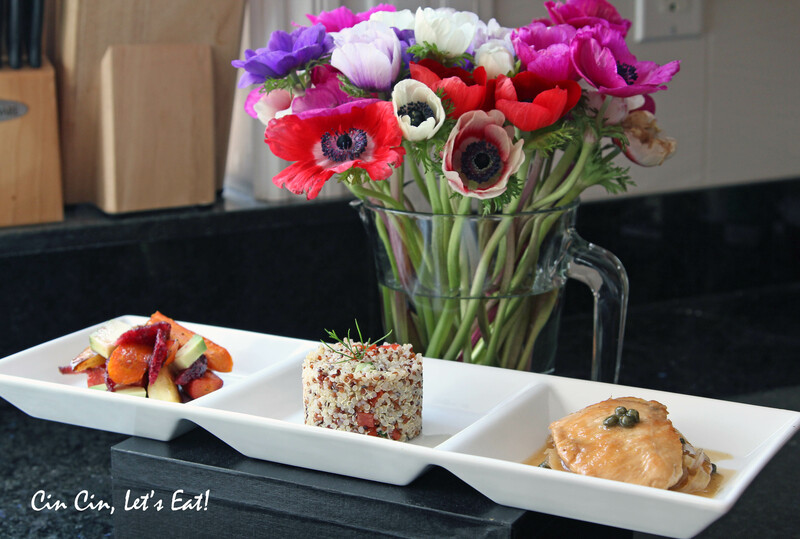 Each dish is easy to make and I kept the number of ingredients to as few as possible to showcase their individual flavors. Definitely a great way to properly welcome Spring, wouldn’t you say? Spread sliced carrots onto a baking pan. Parchment or foil lined for easy clean up. In a small bowl, whisk together brown sugar, vinegar, and oil. Pour over the carrots, and give it a quick toss to coat evenly. Season with salt and pepper. Roast for 25 minutes until tender and caramelized. Let the carrots cool down to room temp. 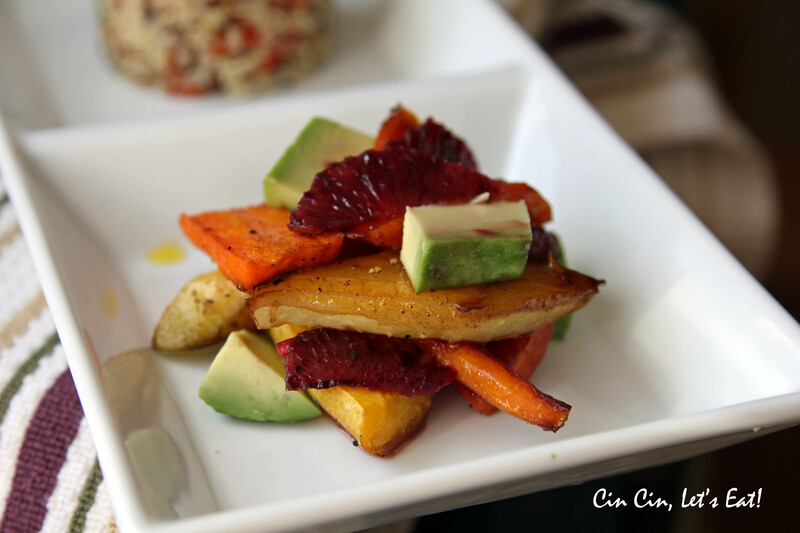 Just before serving, mix in the avocado slices and the blood orange segments. Spoon the remaining blood orange juice over the salad. 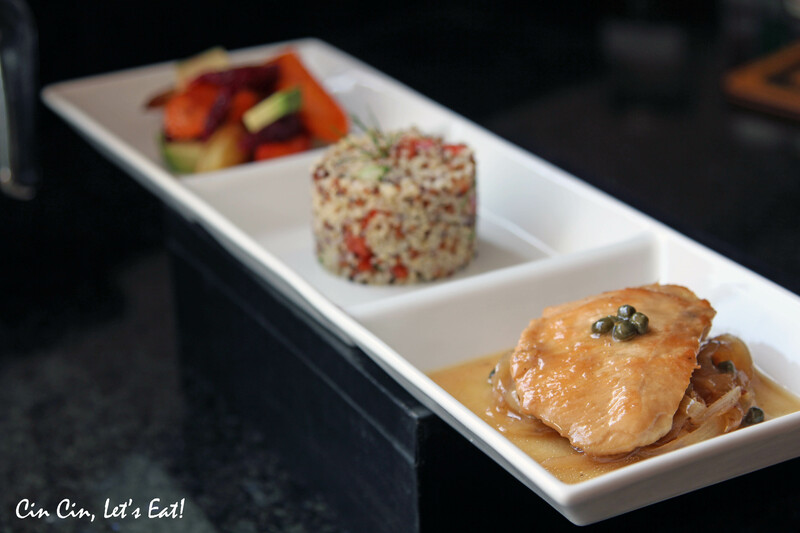 This dish is great at room temperature, but it is equally tasty after refrigeration. Serves 4 as sides, 2 as main entree. Combine quinoa and water or broth in a pan, bring to a boil. Cover and cook over medium low heat for 15 minutes. Quinoa is done when the liquid is absorbed and the germ rings are separated from the kernel. Fluff with a fork. 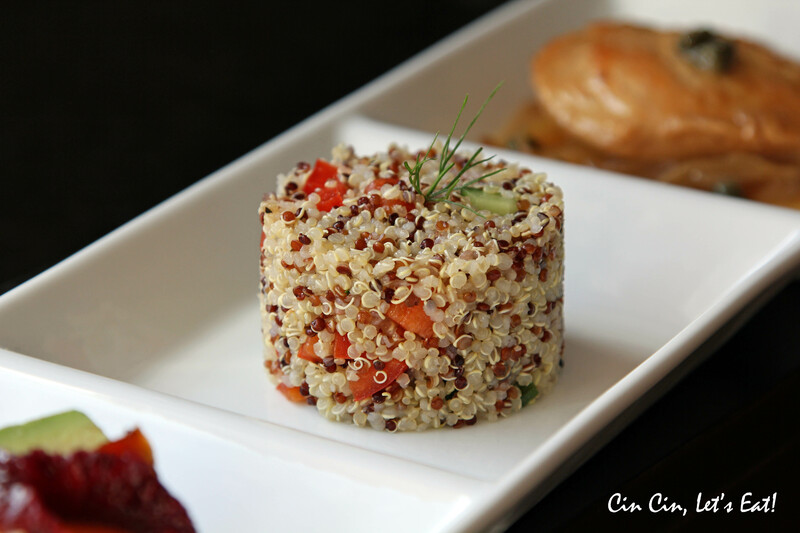 Let the quinoa cool to room temperature, add in diced bell pepper and cucumber. Before serving, whisk the lemon juice, olive oil, salt and pepper together. Drizzle, toss, and serve. 3-4 skinless and boneless chicken breasts. Slice thick breasts in half for a thinner and smaller portion. In a skillet, brown both sides of chicken with 1 Tbsp of olive oil. Note that we’re not trying to cook through the chicken in this step, simply brown both sides and remove from pan. Saute onion in the same pan until translucent, about 5 minutes. Add in capers and a couple tablespoon of the caper juice to stir up the brown bits on the bottom of the pan. 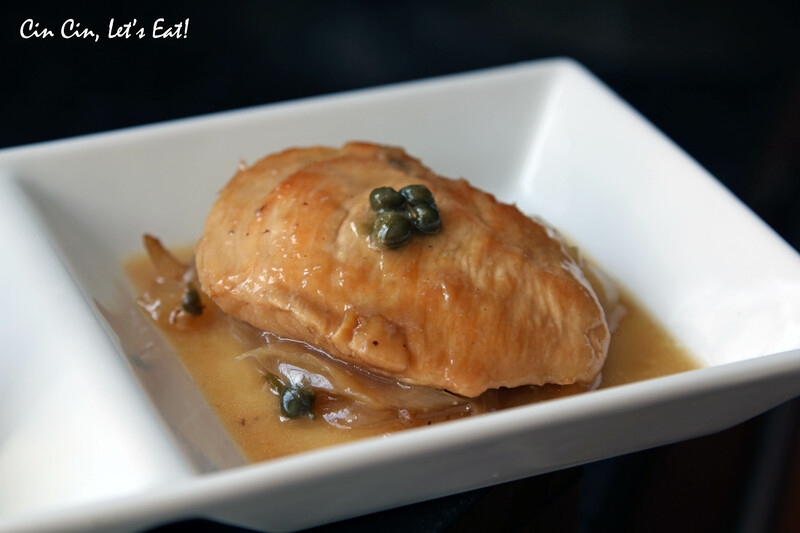 Pour the bottle of marinade into the pan with onion and caper, place the chicken back into the pan. Cover and let simmer, about 5 minutes, until the chicken is cooked through. Season with salt and pepper. Serve and spoon the sauce over rice, couscous, or quinoa. If you like a thicker sauce, remove the chicken first and then reduce by half. Notes: You can easily make your own lemon marinade with some juice of lemon, olive oil, mustard, champagne vinegar, and herbs. I used chicken breasts because I had some on hand, but my usual preferred choice of protein would be skinless boneless chicken thigh, as chicken breasts tend to be drier and tougher, especially overcooked ones. 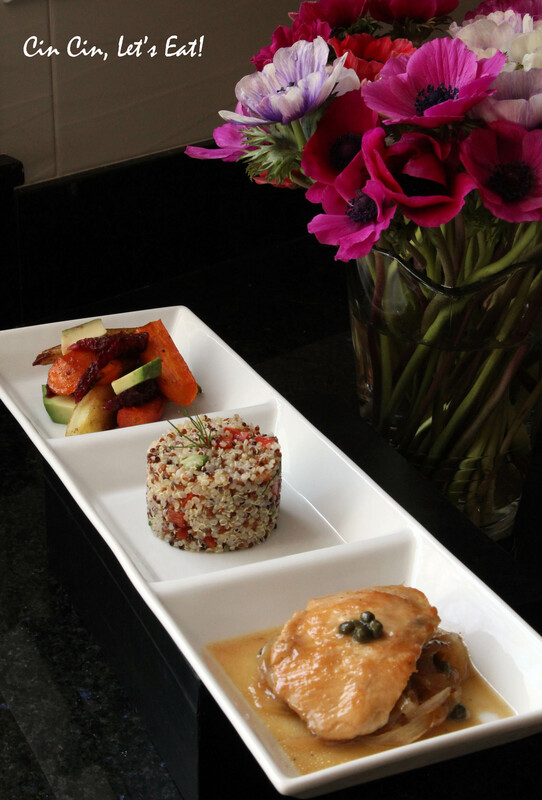 Lovely dishes and pics! Definitely going to try ’em out! 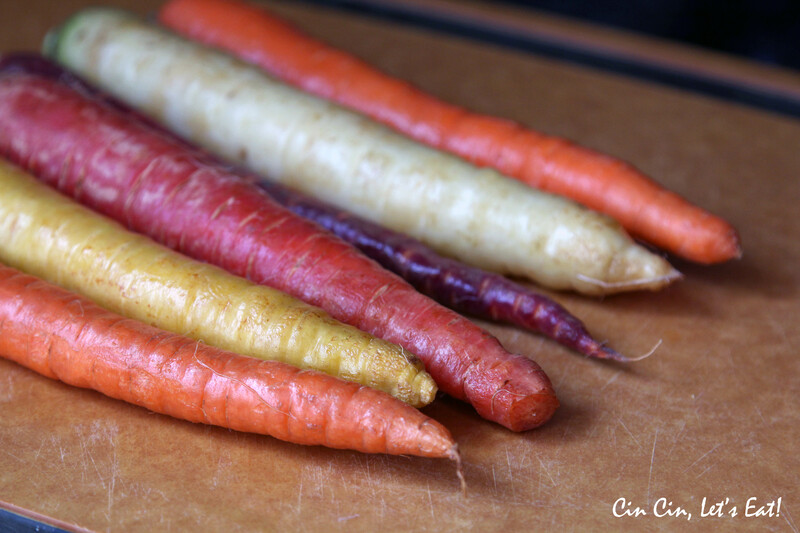 And those rainbow carrots always look so tempting at the farmers’ market. Now I’ll have to pick up a bunch!